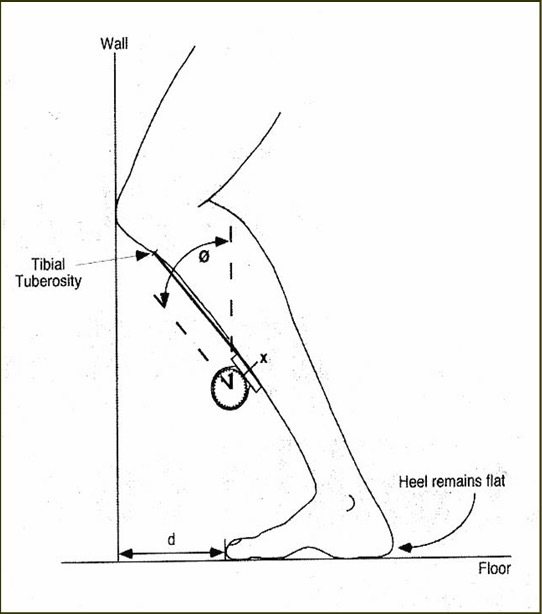 The LUNGE TEST is a weightbearing assessment of the ankle joint range. This is a test which has been shown to have very good reliability / repeatability (Bennell et al, 1998) and prospective studies have also shown it to be predictive of injury (Pope et al, 1998; Gabbe et al, 2004), this is a test which should certainly not be left out (especially when screening uninjured sportsmen and women). Patient stands against wall with about 10cm between feet and wall. They move one foot back a foot’s distance behind the other. They bend the front knee until it touches the wall (keeping the heel on ground). If knee can not touch wall without heel coming off ground, move foot closer to wall then repeat. If knee can touch wall without heel coming off ground, move foot further away from wall then repeat. Keep repeating step 5 until can just touch knee to wall and heel stays on ground. 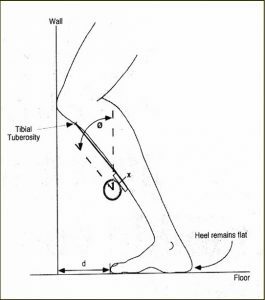 A restricted Lunge test essentially suggests there in an increased ankle joint dorsiflexion stiffness. Research tells us this may increase an individuals risk for lower extremity injury. It may also dictate the appropriateness of concurrent joint mobilisations or a soft tissue stretching programme.